You need a hex editor (download HxD). NOSE can be helpful but is not required. Notation guide: "@" indicates an offset to go to in the hex editor. It is in hexadecimal. 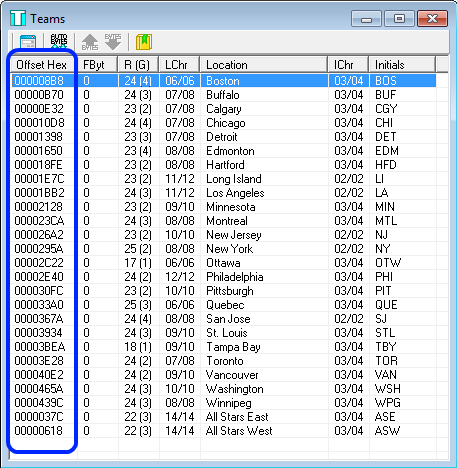 These values tells you where in the ROM the data for each team is located. Now, the nice thing is, you don't need to re-order all the team data to change the team order. There is a list of these offset values in the ROM, and you just need to re-order the list. 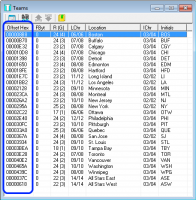 A list of offsets is often called a "pointer table," so you need to re-order the team pointer table (a table of offsets that points you to the location of the data for each team). In NOSE (and the screenshot above), you can see which team goes with which value. So, just re-order the values to re-order the teams. Make sure you keep the pointer table values properly aligned, and don't change the number of pointers. It turned out that my NHLPA 93 ROM was in "SMD" format, not raw "BIN" format, which made it impossible to find the pointer/offset values. Use SMD -> BIN mode. My ROM was actually named "NHLPA NHL '93.bin", (not "NHLPA NHL '93.smd"), so I had to change the input type when trying to open the file. I'll look at Tile Molester. The offset for 94 (both original and 30-team) is @030E. Sweet, this is the information I was looking for this weekend. My only remaining question, then, is how does the ROM or NOSE know whether it's a 28-team or a 30-team ROM?